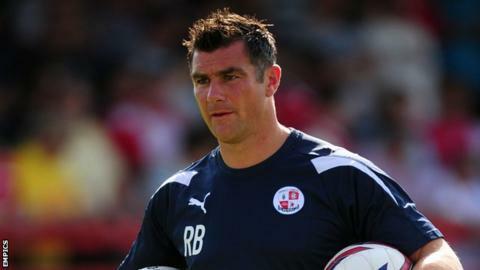 Crawley Town manager Richie Barker says they will not underestimate the Metropolitan Police when the two sides meet in the FA Cup. The League One side travel to the Isthmian Premier Division outfit in their first-round tie on Saturday. He told BBC Sussex: "It's something we won't be taking lightly. We'll be treating them with the utmost respect. "The FA Cup is special. It certainly has been for this club in the last few years and we want to continue that." The Reds have made it through to the fifth round in each of the past two seasons, beating Swindon, Derby, Bristol City and Hull along the way. Barker says their previous Cup runs, one of which was achieved when they were a non-league side, show they must take the Met seriously. "We've seen plenty of Cup upsets at this ground over the last few years," he added. "We'll be reminding the players of what their mentality was when they were causing those upsets. There's every chance there will be the same mentality in the Met Police's dressing room. "We've done OK in the cups so far this year. "We got to the third round of one [the League Cup] and the second round of the other [the Johnstone's Paint Trophy] so we'll be looking to progress in the FA Cup as well."